Product diversification is a strategy employed by a company to increase profitabilityProfitability RatiosProfitability ratios are financial metrics used by analysts and investors to measure and evaluate the ability of a company to generate income (profit) relative to revenue, balance sheet assets, operating costs, and shareholders' equity during a specific period of time. They show how well a company utilizes its assets and achieve higher sales volume from new products. Diversification can occur at the business level or at the corporate levelCorporate StructureCorporate structure refers to the organization of different departments or business units within a company. Depending on a company’s goals and the industry which it operates in, corporate structure can differ significantly between companies. Each of the departments usually performs a specialized function. Business-level product diversification – Expanding into a new segment of an industry that the company is already operating in. Corporate-level product diversification – Expanding into a new industry that is beyond the scope of the company’s current business unit. Concentric diversification involves adding similar products or services to the existing business. For example, when a computer company that primarily produces computers starts manufacturing laptops, it is pursuing a concentric diversification strategy. Horizontal diversification involves providing new and unrelated products or services to existing consumers. For example, a notebook manufacturer that enters the pen market is pursuing a horizontal diversification strategy. Conglomerate diversification involves adding new products or services that are significantly unrelated and with no technological or commercial similarities. For example, if a computer company decides to produce notebooks, the company is pursuing a conglomerate diversification strategy. 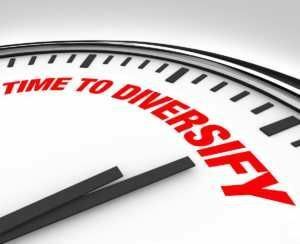 Of the three types of diversification techniques, conglomerate diversification is the riskiest strategy. Conglomerate diversification requires the company to enter a new market and sell products or services to a new consumer base. A company incurs higher research and development costsCost of Goods Manufactured (COGM)Cost of Goods Manufactured (COGM) is a schedule showing the total production costs during a specific period of time. See COGM formula & examples in this guide. COGM is the total costs incurred to manufacture products and transfer them into finished goods inventory for actual retail sale and advertising costs. Additionally, the probability of failure is much greater in a conglomerate diversification strategy. Diversification mitigates risks in the event of an industry downturn. Diversification allows for more variety and options of products and services. If done correctly, diversification provides a tremendous boost to brand image and company profitability. Diversification can be used as a defense. By diversifying products or services, a company can protect itself from competing companies. In the case of a cash cow in a slow-growing market, diversification allows the company to make use of surplus cash flows. Entering an unknown market puts a significant risk on a company. Therefore, companies should only pursue a diversification strategy when its current market demonstrates slow or stagnant future opportunities for growth. The Attractiveness Test – The industries or markets chosen for diversification must be attractive. Porter’s 5 Forces Analysis can be done to determine the attractiveness of an industry. The Cost-of-entry Test – The cost of entry must not capitalize all future profits. The Better-off Test – There must be synergy; the new unit must gain a competitive advantage from the corporation or vice-versa. Before considering diversification, a company must consider the three tests above. General Electric commonly comes in discussions when talking about successful diversification stories. GE began as an 1892 merger between two electric companies and now operates in several segments: Aviation, energy connections, healthcare, lighting, oil and gas, power, renewable energy, transportation, and more. Walt Disney Company successfully diversified from its core animation business to theme parks, cruise lines, resorts, TV broadcasting, live entertainment, and more.